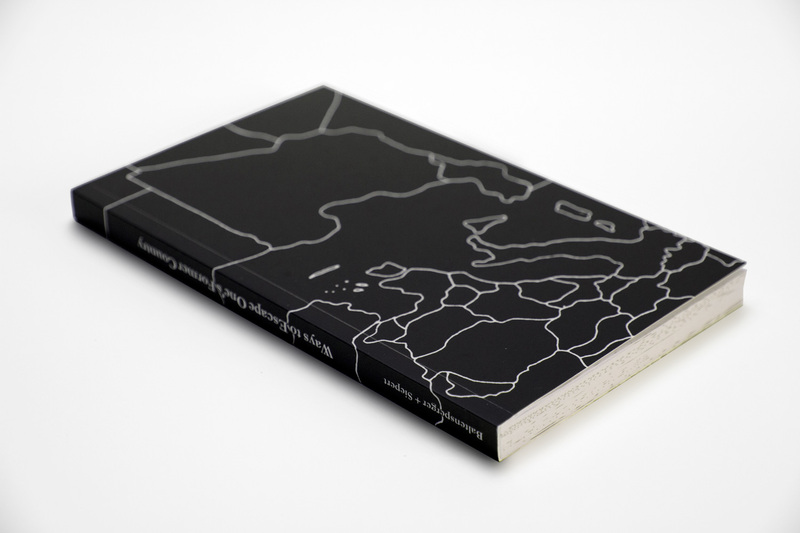 With their book project „Ways to Escape Ones Former Country“ Zurich based artist duo Baltensperger + Siepert make abundantly clear what it means to escape ones home. They will charge 150 USD per person. Men will still get beaten up. Your husband too. But after that, they’ll let you pass. There will be three boats. Let the other people go ahead. Board the third boat. You depart last. Only your boat will make it to Greece. Based on 18 in-depth-interviews with refugees Stefan Baltensperger and David Siepert distilled directions of how to undertake flight. The aim was to create new narrative, as it has almost become impossible to talk about refugees without provoking stigmatisation. “We have heard so many stories about people drowning in the Mediterranean. Stories about death, torture and suffering. We have become almost completely insensitive and apathetic to stories about refugees. 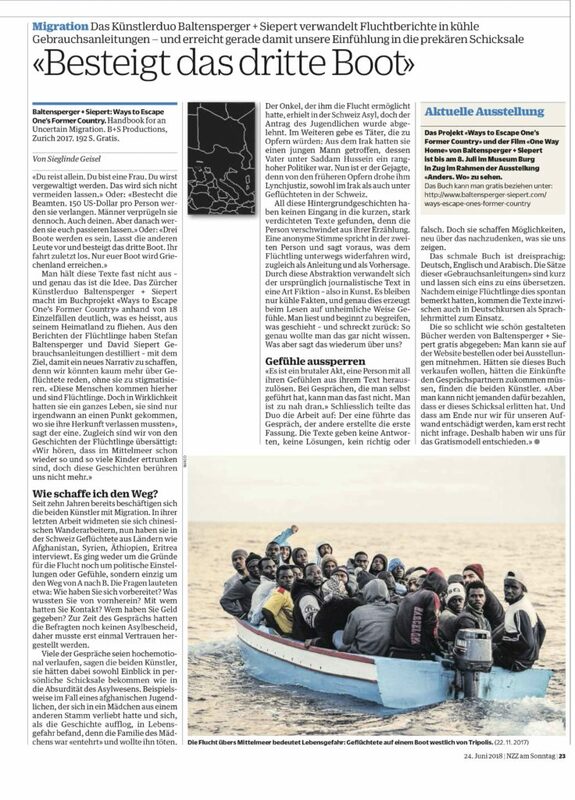 Ways to Escape One’s Former Country is based on interviews that Baltensperger + Siepert held with asylum-seekers in Switzerland over a period of three years. In these interviews, they focussed on people’s actions before setting out and during their journeys. 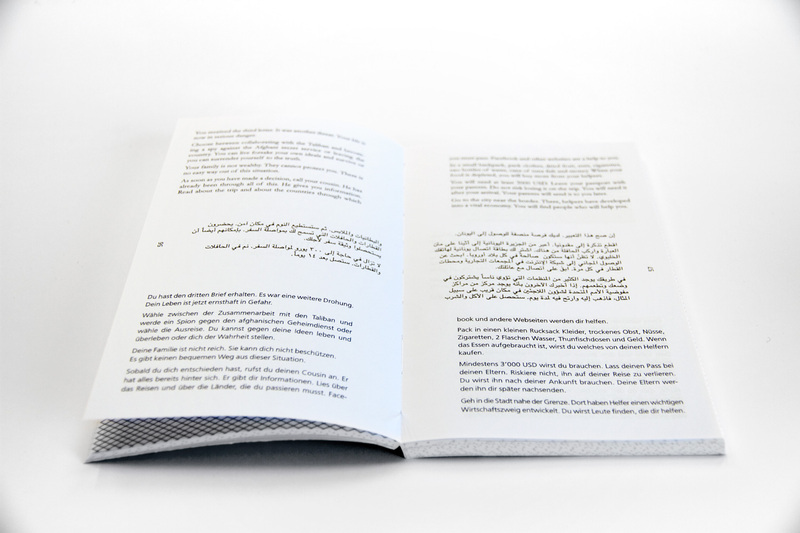 Baltensperger + Siepert have appropriated the asylum-seekers stories, detached them from the narrating subjects, and formulated them anew as direct procedural instructions. Ways to Escape Ones Former Country discovers literary possibilities for thinking about this phenomenon, which is such a determining one for our times. The work tries to circumvent the identity of refugees as objects of circumstance, creating an experience which takes place in the readers themselves and escapes the usual media narratives. Through a shift in perspective, the readers are spoken to with an immediacy that places them in the position of a person in flight.